Each day a student adds one post-it to the growing number line. In this case, a kindergarten student wrote the number and posted it. The student then leads the class in counting the days they have been in school. Many teachers now arrange this growing number line into a growing hundred board configuration, varying the color for each group of ten. This morning routine supports students as they develop proficiency with the concept of "one more" or "next number" in counting. Requiring students to write the numbers (with appropriate support modifications, as necessary) provides practice in forming the numbers and growing experience in place value as students watch what changes and what stays the same. This morning routine flows very nicely into the School Day Count which directly support student development of the concept of place value in writing numbers. See Morning Math Routines: Photo Gallery for additional pictures. Each day a student adds one straw or craft stick to the ones pocket or cup. The student holds up each straw in the ones pocket and leads the class in an oral count. The student and class decide if they have enough straws to make a bundle (of ten) to move to the tens place. Students will quickly begin to make predictions that "tomorrow is a bundle day" or "Friday will be a bundle day." After leading the class in an oral count of straws in all pockets, the student makes the change in the posted number so that it reflects how many days they have been in school and how many straws they have collected in the school day count pockets. 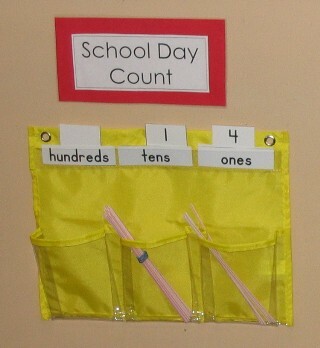 If students use labeled cups to hold straws, then use a school day count poster to write the days. 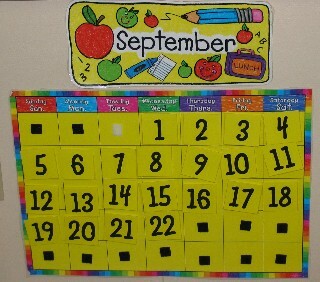 Laminate the poster and let students use dry-erase markers to change the number of days. 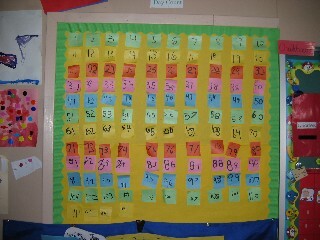 Each day a student selects the number card for the day's date and posts it on the calendar. Alternatively, the student may write the number on a post-it to add to a blank calendar. Teachers often use the latter method to initiate pattern work, beginning with a color pattern of post-its so that students have to identify both the number and the color to complete the pattern. The student completes the activity by leading the class in reading the complete date for the day: today is [day of week/month/day/year]. Online Resources: There are great online resources for the classroom calendar routines. The following represent a sampling of some of the best. Bookmark these sites for future reference. Mrs. Meacham's Classroom Snapshots include pictures of calendar routines. She also includes downloadable files (Word or pdf) for student calendar folders. This is a terrific resource for primary teachers! Jan Brett Monthly Calendar Pocket Chart: site has pdf files to download to create special calendar components in true Jan Brett style. Holiday Calendar Squares from Preschool Printables include the major holidays. Themed Numbered Calendar Squares from Preschool Printables include apples, dinosaurs, backpacks, stars, etc. Holiday Calendar Number Squares from Preschool Printables include pumpkins, turkeys, hearts, etc. Seasonal Numbered Calendar Squares from Preschool Printables include snowflakes, leaves, pumpkins, butterflies, etc. Each day a student adds another penny to the coins-to-date. The student leads the class in counting all of the pennies and decides if the class has enough pennies to trade for a nickel. After appropriate trading of pennies, the student leads the class in checking to see if they can trade nickels for a dime, dimes and nickel for a quarter, etc. 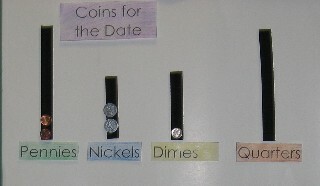 After all trading is complete, the student leads the class in an oral count of the day's coins. 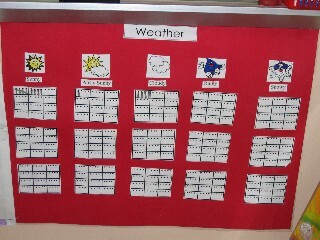 Each day a student checks the weather and marks the graph or tally chart appropriately to record a sunny, partly sunny, cloudy, rainy, or snowy day. This daily data-collection activity provides real data for students to examine to answer teacher questions about what kinds of weather they've had so far in the month, whether they've had more sunny or more rainy days, etc. If the teacher collects data on a smaller monthly chart and posts these completed charts in the classrooms, students can then compare months to discuss patterns in sunny, rainy or snowy days and make more accurate predictions about the current month's weather. Each day a student counts the students present in class that day and writes the number in the appropriate box on the Class Attendance Count. The student then uses mental math to figure out how many students are absent that day and records the number in the appropriate box. The student reports the results to the class. 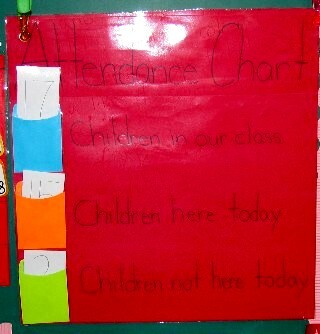 Some teachers choose to use a small laminated chart so that students can use dry-erase markers to record the day's attendance information. Two different style charts can be used for this purpose: a simple word chart or an attendance chart that reinforces the total-part-part composition of numbers.